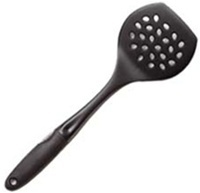 Try the OXO GOOD GRIPS Stainless-Steel Spoon for stirring, portioning and serving. Its oversized head lets you dole out generous portions, and its soft handle nestles comfortably in your palm. The OXO GOOD GRIPS Stainless-Steel Cooking Utensils feature generously proportioned working ends. Try our Fork for piercing potatoes or transferring a pot roast from pan to platter. Its soft handle cushions your hand and absorbs pressure. Use our GOOD GRIPS “Swing Lever” Ice Cream Scoop for perfect scoops of ice cream. 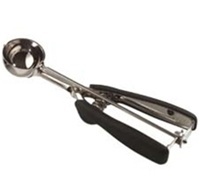 This Ice Cream Scoop yields large round scoops of ice cream with a simple press of the lever. A tab on the Ice Cream Scoop keeps your hand from sliding up as you scoop, and the soft, non-slip handle relieves pressure on your hand. The OXO GOOD GRIPS 12” Locking Tongs feature brushed stainless steel with soft, non-slip handles and comfortable thumb rests. Easily lock these Locking Tongs in a closed position for convenient storage. The lock consists of a large pull-tab that doubles as a hole for hanging. Our GOOD GRIPS Locking Tongs are also available in a 9-inch and 16-inch size. The generously proportioned head on our OXO GOOD GRIPS Stainless-Steel Ladle lets you serve ample portions of your favorite soups, stews, and sauces. This sturdy tool features a soft handle that nestles in your hand and absorbs pressure. The generously proportioned head on our OXO GOOD GRIPS Stainless-Steel Spaghetti Server lets you serve ample portions of your favorite pasta. This sturdy tool features a soft handle that nestles in your hand and absorbs pressure.